Well I finished my second pass through Montmartre cemetery yesterday. My goal ever since we arrived in Paris last August was to make a thorough sweep through each of the cemeteries in Paris to photodocument their funerary sculpture, and then pass through a second time later in the year when the foliage all came off the trees. And it was a gorgeous day for taking photos -- at least in Montmartre before the rain hit later in the afetrnoon -- so off I went. And along the way I stumbled across the little gem (that's it up there). It's a simple, sweet stone marking the final resting place of one Louise Weber, known locally as "La Goulué", who was the creator of the French Can Can! Now all I have remaining is to videotape the last seven divisions at Pere-Lachaise. I'm also hoping to tape Marie and Philippe talking about Paris cemeteries once or twice more before we leave the end of March. They are unbelievable repositories of information and the stories they can tell. . . . 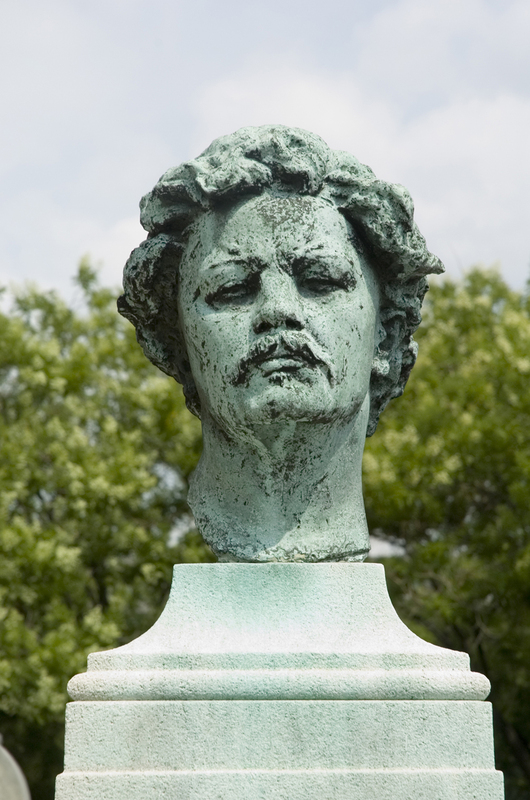 Speaking of Marie she was out at Pere-Lachaise yesterday and discovered that the bust of Valentin in division 2 is missing. We have yet to ascertain whether it is theft or another one removed by the conservation for safekeeping.